When we think of taste in fashion, we imply a sense of the moment. Timeliness is implicit in the notion of the correctness of fashion. The person who is out of fashion is out of place. Yet also implicit in this conceit is the notion that some players can step out of bounds, actually should step out of bounds and not play the game so hard. With age comes the ability to refrain from the novelties of fashion and to sometimes embrace qualities that once reigned supreme. It is always a balancing act, but this maybe what is meant by sticking to the classics of fashion taste. Of course, the classics evolve; they just do so at a pace that allows several generations of players to mount the stage without anyone appearing too non-courant. 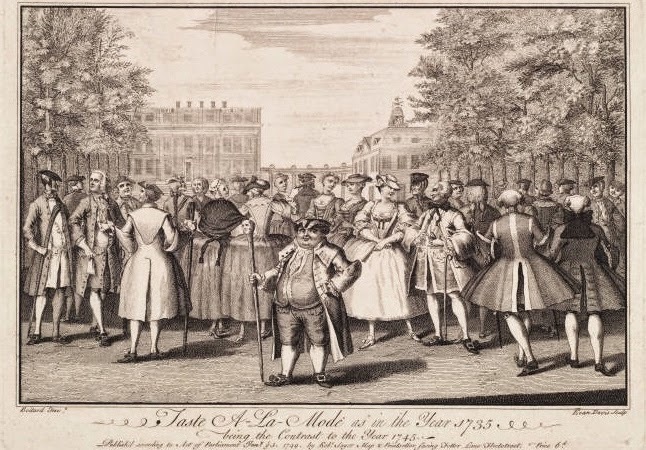 The illustrations from 1745 illustrate the differences between 1735 and 1745 as a form of satire, but the snippet of a longer a letter from Horace Walpole, the Earl of Orford, to Sir Horace Mann speaks to the at once mocking and yet enjoyable moment of fashion past invading fashion present at a court levee of George II in the autumn of 1742. "I have not felt so pleasantly these three months as I do at present, though I have a great cold with coming into an unaired house, and have been forced to carry that cold to the King's levee and the draw­ing-room. 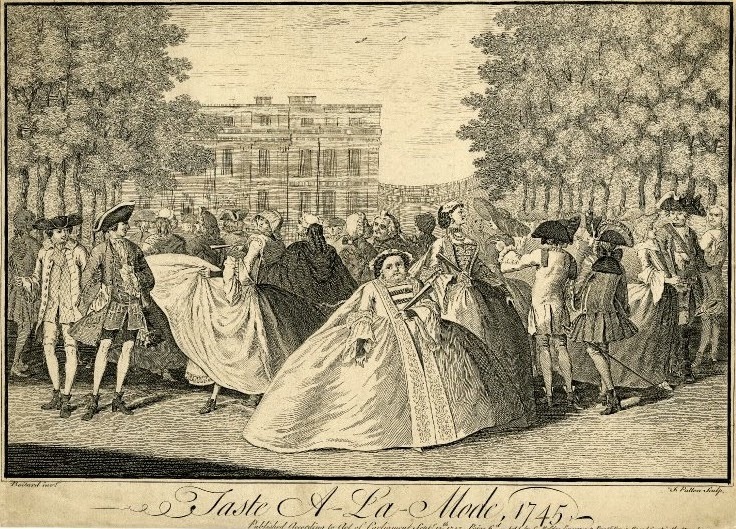 There were so many new faces that I scarce knew where I was; I should have taken it for Carlton House, or my Lady Mayoress's visiting-day, only the people did not seem enough at home, but rather as admitted to see the King dine in public. Tis quite ridiculous to see the numbers of old ladies, who, from having been wives of patriots, have not been dressed these twenty years; out they come in all the accoutrements that were in use in Queen Anne's days. Then the joy and awkward jollity of them is inex­pressible! They titter, and wherever you meet them, are always going to court, and looking at their watches an hour before the time. I met several on the birth-day, (for I did not arrive time enough to make clothes,) and they were dressed in all the colours of the rain­bow: they seem to have said to themselves twenty-years ago, "Well, if ever I do go to court again, I will have a pink and silver, or a blue and silver," and they keep their resolutions." Note: In 1742 Carlton House was the residence of Frederick Prince of Wales.